Continuing with what has turned into a mini-series. If you missed the first two you can easily get caught up here and here. Meeting our sons for the first time is an experience and memory forever in my mind and heart. Beyond words and yet captured for all time in my heart to hold. I was nervous, anxious, excited, overwhelmed and full of hope and joy! I managed to hold back my tears as I hugged them for the first time and finally saw their most beautiful smiles. I will never forget their sweet little giggles as my husband blew bubbles for them to chase and catch. The next day we headed to the U.S. Embassy for the visa interview. We didn’t know what to expect as the original birth certificates had been lost at the passport office. I had a pit in my stomach thinking there was no way we would pass without them. I found myself constantly praying. Never have I prayed so much in such a short amount of time in my life! Over five hours sitting in a row of chairs answering questions and waiting for our names to be called. Praying and hoping we would be given the blue slip of paper meaning we passed. I tried to remain calm as the officer said they would waive the need for original birth certificates if it was okay with us and he proceeded to hand me the blue slip!!! My eyes immediately filled with tears as I told my husband the news. I wish I had on camera the joy on all of our faces as we literally ran out the door through the embassy courtyard swinging our boys in the air! I knew my prayers were answered!! We were given an appointment to go back to the embassy in two days at 1:30 to pick up the visas. Two days later I stood in front of the embassy which seemed rather quiet as a police officer informed me they were closed. Assuming it was a misunderstanding I showed him my slip stating my 1:30 appointment, which further puzzled him because the embassy closed at 12:00 that day. After speaking with security he told me to come back in two days, which would be Friday. The patio at the third hotel we stayed at, where we spent a lot of time. This time my husband went back to the embassy and was given one visa. He was then informed there was a misspelling on the other passport. We would need to have the passport office issue our son a new one before they would print the visa. Something which took us months to get we needed to try and get reprinted in 3 days as our flight was scheduled to leave Tuesday evening. Oh by the way, my suitcase was still lost. Thankfully I packed an extra outfit in my carry on, but other than that I was grubbing it in the same clothes and borrowing my husband’s clothes for sleeping. It also gave my husband the opportunity to grow a beard as his shaver was in my bag. I tried not to think about the what ifs and the possibility of it taking weeks to get the new passport. It was truly God’s grace and prayer that kept this type A person so, so calm. Besides at this point it wasn’t about me anymore, mere inconveniences or another stumbling block. My focus was completely on my boys. On Monday, the day before we were scheduled to leave Ghana, my husband headed to the passport office begging someone to sign off on the reprint. I can’t even imagine the excitement you must have had. It’s pretty clear that you were 100% helpless at that time as to what was going to happen. When that happens I *try to just let go, sit back and enjoy the ride God has me on. Not yet easy, of course. 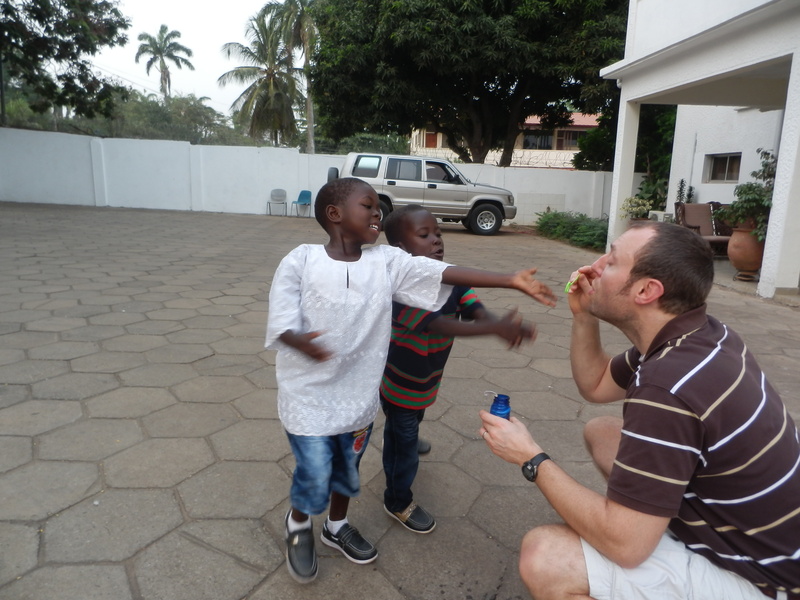 The picture of the boys and your husband blowing bubbles reminds me of a guest house my father in law always has us stay in when we are in Accra. It must have been kind of surreal being cooped up in a hotel almost the entire time. Locked in an unfamiliar new and exciting suspension of time and space. Sounds like you didn’t really get to explore Ghana and it’s sites and people since this whole fiasco was happening! Probably would be great to one day have a trip back, although veeery expensive, to do just that. Looking forward to the “to be continued….” of the story. By the way! Love the updated picture of you and the boys. Where’s your husband though? Might as well throw in the whole family! God definitely had me completely letting go of any control, but it was a blessing because then I could just focus on our boys. I would love to go back and visit Ghana someday. I really wish we could have seen more while we were there. Haha, true about the picture although he prefers me not to put too many of him up!